At one point called “Ye Ancient Dogge of Malta,” the Maltese is also known as the Maltese Lion Dog, the Melita Dog, the Roman Ladies’ Dog, the Bichon Maltese, the Maltese Spaniel, and the Maltese Terrier. These dogs have been the canine world’s aristocrat for centuries, and they are well known for their snowy white, long, cascading coat, the gentle, spirited disposition, and their dark, beautiful eyes. For hundreds of years, the Maltese has been a popular companion dog, although these toy dogs were not recognized by the AKC until 1888. The Maltese traces back to the island of Malta, and the breed goes back at least as far as 3500 B.C. This breed is thought to be most ancient of all the European toy breeds. Malta’s Roman governor, Publius, who was govern in the first century A.D. was known for having a beautiful Maltese whose name was Issa. The poet, Martial, made Issa famous by writing a poem about her. A variety of other celebrated authors have also written about the beauty and intelligence of the breed. Aristocratic ladies among the ancient Greeks loved having small pet dogs. They would let them sleep in bed, feed them delicacies, and groom them regularly. These dogs were so valuable that there was an international trade for them long before the time of Christ. In fact, these dogs were so valued that the Greeks erected tombs for Maltese dogs, honoring the dogs in art starting in the 5th century. Obviously, the Egyptians fancied the dogs as well, since statues of Maltese dogs have been discovered among Egyptian ruins. Not only was the Maltese a friend for the wealthy Romans and Greeks, the breed also became a popular lapdog for the aristocrats in Britain as well. Mary Queen of Scots and Queen Elizabeth I both had a Maltese. The breed was described as being the “size of squirrels” in 1792, and many ladies would carry the dogs in their sleeves and bosoms. During the 17th century, poor shepherds were the primary individuals left on Malta, and these small dogs became quite rare. However, the breed didn’t die out. One portrait from 1833 that is housed in Malta’s Royal Library is an accurate portrait of a Maltese dog. Although many old writings and artifacts depict dogs that closely resemble today’s Maltese, they also may resemble the Pomeranian breed, as well as other toy breeds. Meticulous record keeping and breeding show that the pure Maltese breed didn’t begin until the middle of the 1800s. During the 19th and 20th centuries, the Maltese breed rose steadily in popularity. Once the dog of the rich and famous, these dogs gained a following among commoners as well. The breed became popular as a pet in Britain by the mid 19th century, and they showed up in English show rings as early as 1859. 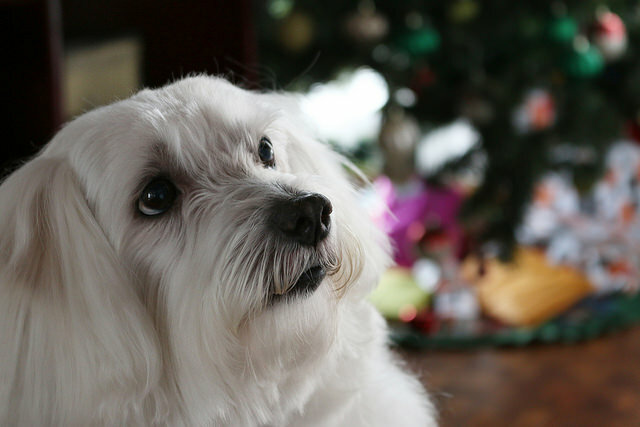 The very first Maltese shown in the United States was a white “Maltese Lion Dog,” which was entered in 1877 at the Westminster Kennel Club Dog Show. It wasn’t until a bit later, in 1888, that the Maltese was first accepted for registration by the American Kennel Club. While there have been several breed clubs in America, today there’s only a single club known as the American Maltese Association. 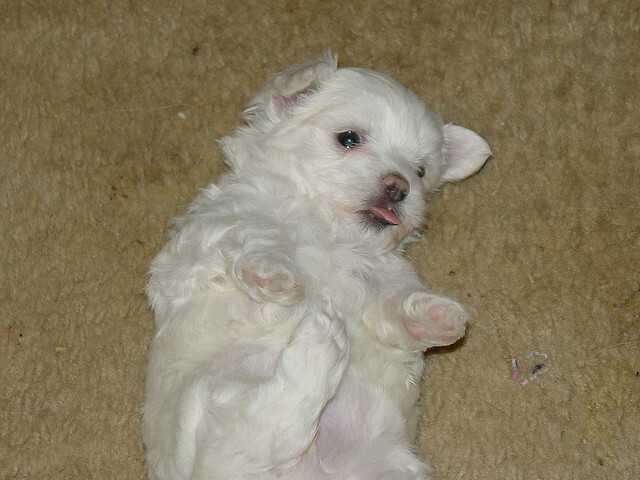 The Maltese is a very small dog that has a silky, long white coat that can hang to the floor. The hair shouldn’t be curly or wavy and there’s no undercoat. They have pendant shaped ears that are covered in hair, and the tail drapes down over the back. The breed has dark, round eyes that have dark rims, as well as a black nose. Their muzzle is tapered slightly, they have a long neck, and should carry their head high. 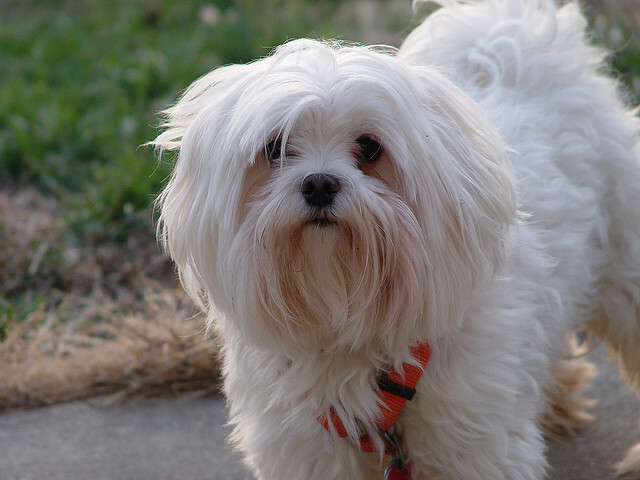 While weight standards for the Maltese vary, most of these dogs weight from 4 to 8 pounds. An adult generally is 8-10 inches tall at the shoulder. Although the Maltese is small, these dogs seem to lack fear. They are affectionate, responsive, and trusting, and while they are very gentle, they are also very playful and lively. 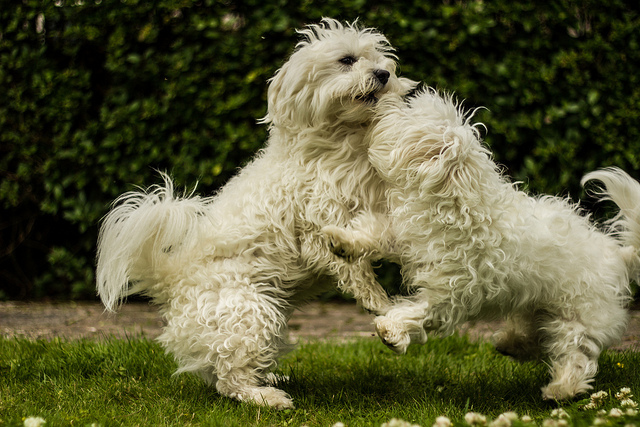 While the Maltese is naturally playful, easygoing, and sweet, their temperament may be altered by the way they are raised. 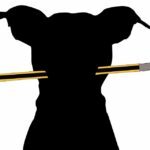 Spoiling these dogs or failing to train them appropriately may result in bratty behavior. These dogs don’t need a lot of exercise, but they do need daily walks. They enjoy running, so giving them some time to run around can help them get rid of their extra energy. 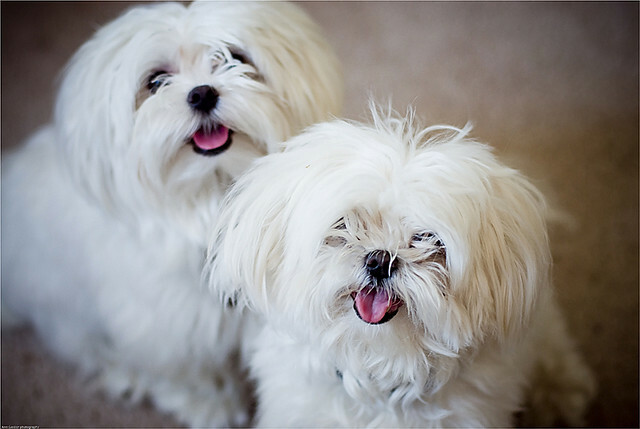 While the Maltese barely sheds, they do need to be brushed daily to prevent mats and tangles in their long hair. Mats should always be eliminated before bathing, since water tightens the hair and makes the mat even worse. Brushing these dogs regularly also keeps them clean, which is important, since they get dirty easily. Because of their white hair, tearstains may be problematic. Using a veterinarian-approved cleanser and a soft cloth to clean the face should help minimize stains. Food and water can also cause staining, so it’s essential to wipe the dog’s face after his meals and after drinking. 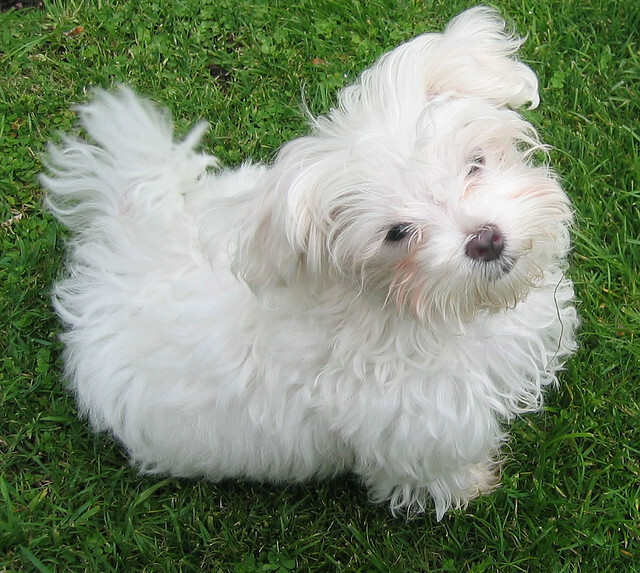 The ears of the Maltese should be checked regularly for infection, irritation, and wax buildup. The ears should be cleaned regularly as well. Since they grow a lot of hair in the ears, it may need to be removed. Weekly teeth brushings are also essential. 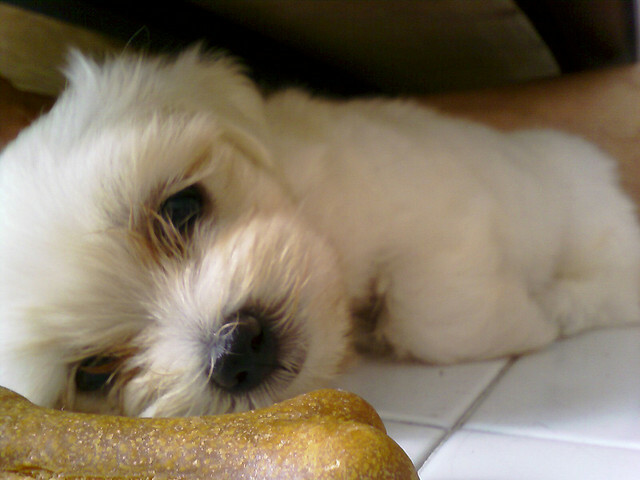 A part of the Toy Group, the Maltese is a lap dog that has no working roles beyond that of a companion. Wow – Thank you for so much for all this awesome information about the beautiful Maltese breed. I have had the pleasure of owning many different breeds of dogs throughout my life, and all of them brought much joy and happiness to my world… However there is something just so incredibly precious about the Maltese breed, there is no other breed quite like it..